Engr. Jaime Boboy La. Jimenez, Jr.
23 years ago, with his family as his inspiration he worked as the Chief Executive Officer of the Mariners’ Polytechnic Training Center (MPTC) in Las Piñas. His commitment and dedication were the traits that made him dear to people whose lives he was able to touch. Engr. 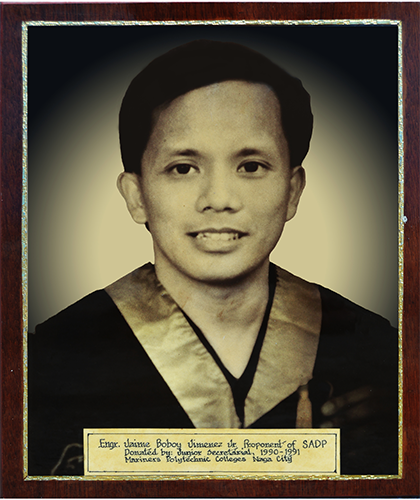 Jaime “Boboy” Lazaro-Jimenez, Jr. was a graduate of Malate Catholic School in 1975. He finished the Naval Architecture and Marine Engineering (NAME) degree in 1980 at NAMEI Polytechnic Institute in Mandaluyong. His peers, subordinates, friends and students alike remembered him for his brilliance, humility and tact. Early in the night of December 20, 1990, barely five days before Christmas, he instructed his staff to prepare a dinner for them to eat together. His secretary then named Josie and Edgar, a faculty member recounted that Boboy was in high spirits. Earlier he handled the opening class of the General Tanker Safety Course, a newly introduced program at the MPTC. He was so excited with his teaching chores that time and many were wondering why? Josie, on the other hand, remembered Boboy’s final instruction to her. She recalled, “Bilin ni sir gumawa raw ako ng maraming kopya ng bagong composition ni Jose Mari Chan: “Christmas in our Hearts” para kakantahin namin sa aming Christmas program.” It was during the Christmas season of 1990 that the composition of Jose Mari Chan song was first introduced. At about 7:20 pm, Josie received a call for Boboy from a lady but Josie could not remember her name. Josie recalled that Boboy keeps on laughing while he talk with the lady on the telephone. When Boboy was about to get in his car to go to Makati for an official appointment, strangely, according to Edgar and Josie, “He alighted from his car three times, returned and sat for 15 minutes on the driver’s seat before he sped away.” Edgar and Josie observed that Boboy seemed reluctant to go and that they considered it as a premonition because it was rare for Boboy to vacillate. About 20 minutes after his departure, a nurse from the Parañaque Community Hospital called and reported that Boboy was shot. Boboy’s family particularly Commo Dante L. Jimenez, was so shocked and dismayed of what had happened. In fact he couldn’t recognized his brother as he lay prostrate in a hospital bed. His face was swollen and his head was bleeding profusely. Boboy doesn’t have enemies and he was loved dearly even by street children because of his kindness. At the time of tragedy; he was running a small civic organization whose principal mission was to alleviate the plight of street children in Metro Manila. “God allows sufferings and trials but he stops the enemy from extending further damage to those who call on Him”. This was the quotation from the Bible that came to the mind of Comm. Dante. Merle, one of his sisters and who was very much close to him described Boboy as “malambing” to her. That is why she was extremely pained by Boboy’s death. Commo. Jaime, Sr. (his Dad) broke down and cried when he and her wife Eliza arrived in the hospital. The murder of Boboy had a deep impact to his brother Dante that resulted in his subsequent transformation as a street parliamentarian. It was the tragic incident in the family that turned Dante’s personality from a timid, unassuming person to a militant street crusader. Post by Mariners' System [official]. The noble role of Boboy started in the streets of Parañaque. He was always there to alleviate the sufferings of the street children. And this was the reason why Mariners’ System continued Boboy’s commitment to the street children in Bicol region. Naga City --- The Mariners’ Polytechnic Colleges (MPC) of Naga City, together with 10 schools and universities in Naga City joined the 5K FUN RUN dubbed as “Dalagan… Tabang sa mga Biktima ni Yolanda,” on Sunday, December 15, 2013 to raise fund for families ravaged by super typhoon Yolanda most particularly the need of students and Higher Education Institutions in Visayas area. The said fun run was sponsored by the Commission on Higher Education Regional Office No. 5 through the Bikol Foundation for Higher Education (BFHE). Dr. Gabriel L. Jimenez, Executive Vice President of MPC Naga represented Dr. Marilissa J. Ampuan, the President of MPC Naga and another executive officer of the BFHE who joined the fun run in Albay to be with the other officials of BFHE. The students, faculty members and staff were headed by their respective NSTP teachers through the leadership of Mr. Leonilo S. Ponteros as NSTP Coordinator and Mr. Jose Van B. Galvo, designated as school coordinator for the said event. The 5-kilometer Regional Fun Run that took place in the six provinces of the region, is the brain child of the Commission on Higher Education-Regional Office V (CHED-ROV) for the purpose of allocating additional funds for the unfortunate families affected by the wrath of Typhoon Yolanda particularly in Samar and Leyte. The Elsevier Foundation announced today the 2013 grant recipients for the Innovative Libraries in Developing Countries and New Scholars award programs. In total, $700,000 has been committed to ten institutions around the world in addition to five ongoing multiyear grants and the Nurse Faculty program. The Elsevier Foundation is funded by Elsevier, a global provider of scientific, technical and medical information products and services. Towards the Collaborative repository for Ethiopian academic and research institutions, Consortium of Ethiopian Academic and Research Libraries (CEARL) and African Digital Library Support Network (ADLSN). Elsevier is a world-leading provider of scientific, technical and medical information products and services. The company works in partnership with the global science and health communities to publish more than 2,000 journals, including The Lancet and Cell, and close to 20,000 book titles, including major reference works from Mosby and Saunders. Elsevier’s online solutions include ScienceDirect, Scopus, SciVal, Reaxys, ClinicalKey and Mosby’s Suite, which enhance the productivity of science and health professionals, helping research and health care institutions deliver better outcomes more cost-effectively.